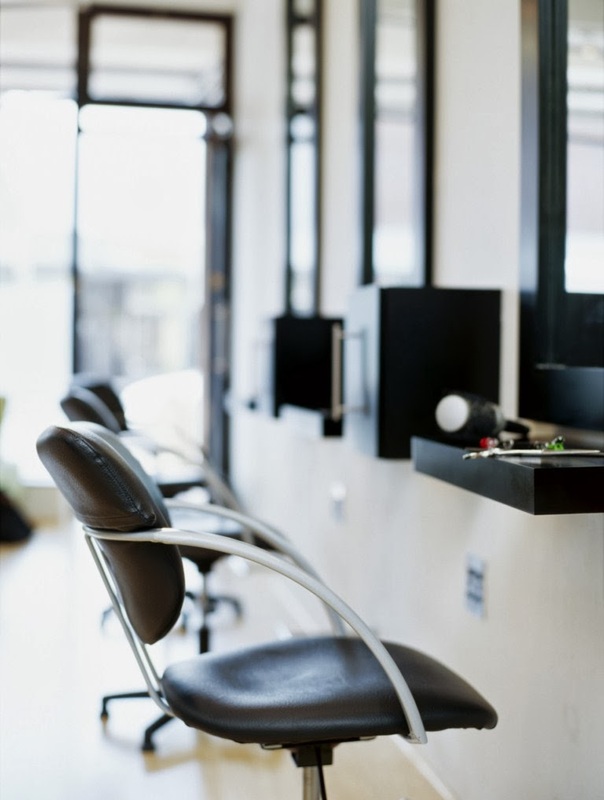 As a salon owner, you understand that there is only one chance to make a 1st impression on a client, and that 1st impression is the one that lasts the longest. Everything from the decor in your salon, to the energy and vibe that can be felt when they enter your space, to the organization of each styling station and how your stylists look while working contribute to this 1st impression. for all of your stylists and colorists. Made of bleach resistant polyester, this tunic is flattering and will not get ruined while handling chemicals! Easily maintain your salon's professional appearance, as well as your stylists' comfort, with this great new tunic. 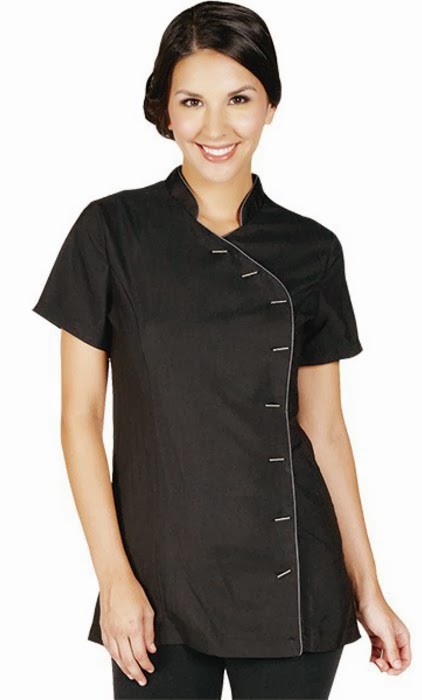 With an Asian-inspired design, Mandarin collar, and asymmetrical button closure, this tunic is cute and wearable, while maintaining full functionality. Available in a variety of sizes! New Uniform Styles From Noel Asmar! We have just added a few fun, new styles to our best selling uniform brand, Noel Asmar Uniforms! They have a modern look and great accents for a fun, yet professional appearance. The Coco Women's Top comes in 3 different accent color options of pink, white, or all black. The Jada is a fashionable runway inspired look, and the Valentina is a wrap top with white accents. Also added to the collection are leggings, which are always popular. The Coco Woman's Top with Pink Trim. Stylish a-line design with peek-a-boo accents of hot pink trim built into the sleeve and side slits. The Coco Woman's Top with White Trim. Pops of color cleverly and sensually emphasis the peek-a-boo detail that comes in white. Slits of color built into the sleeve accentuate the color and allow for more movement. The Coco Woman's Top with Black Trim. Stylish a-line design with accents of faux black trim built into the sleeve and side slits. The Jada Woman's Top - Black with Gold Zipper. This runway inspired silhouette is chic and clever - and hardly seems a uniform. The gold trim, blazer-like shape and asymmetrical front zipper closure fashion elements look beautiful backed up with the hard working hidden functions like, knits side panels and side vents for ease of movement and secured side pockets. The Valentina Woman's Top - Black with White Trim. White satin lines simply yet strikingly outline this ever-so-flattering wrap top creating classic elegance that moves with you. Fluid lines, matte meets shine detailing, subtle pockets. Long sleeves of knit add to the ease of movement with the ‘high/low’ cut adding to both the fashion forward feel and the Noel Asmar brand of clever functionality. Micropoly Leggings - Black. A luxurious every day legging that holds up to your busy lifestyle. Silky smooth lightweight leggings with an encased elastic waistband. Works well under a long jacket or sweater. Strut Your Stuff In Your Salon With Adorable New Stylist Aprons! I love going to get my hair done....salons are such fun, funky, stylish places that I feel glamorous just sitting in a waiting chair. But do your stylists still feel fun when they come to work? Too often, employees feel complacent about their work when it is the same place, same music, same EVERYTHING every day. Spice things up a bit for your stylists with these adorable new stylist aprons by Beauty Love. Sometimes, just a tiny change will go a long way! Available in 3 Fun and Flirty Styles! Available now from Pure Spa Direct in 3 fun and flirty styles, these stylist aprons are comfortable and are made from stain-resistant and water-resistant fabric to survive all the abuse fabrics encounter daily in a salon. These aprons are super-cute AND super-functional - your stylists will no longer be complaining about getting water on their favorite top or dye on their favorite pants, because they will be protected! Pick some up today for each of your stylists, and pump some fun back into their day!